Now you can start gluing on the sequins, one by one! Using a gel craft glue is great, as it is clear while wet so you can see clearly what you are doing while placing them into position. Resting a sequin on your finger, place one blob of glue on the back of a sequin and press firmly down onto on the canvas. If you are dealing with small areas and corners cut your sequins to fit. Apply the sequins one at a time and one layer at a time. 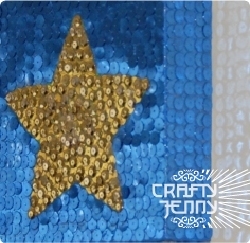 Glue your second layer of sequins on, overlapping your first layer of sequins to completely cover your canvas surface. (Refer to photos of star picture in process to see this). Don't forget to do the sides of your canvas too. Allow it to dry and then hang on your wall!